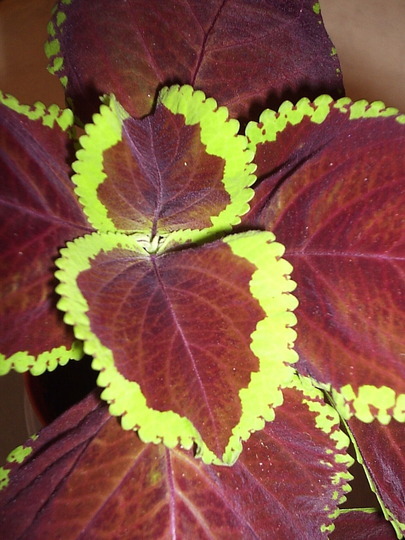 gardening with friends : Coleus "Chocolate Mint"
Gorgeous colour David and with a name like that good enought to eat ! Lovely photo of a lovely plant, David! Just like you I used to fill up every possible space with these plants. In Spain I used to grow enormous plants in very small pots! One summer they got blown off a windowsill on the 5th floor! I had a wooden bar across the windowsill (outside) but it broke & the plants ended up in the street below! It was a Sunday afternoon in the summer & we had gone to have lunch with my parents-in-law. There was a big thunderstorm & the wind & rain combined to make them fall off. Nobody was hurt but I always imagine it must have been quite a sight - half a dozen, or more, Coleus floating down out of the sky!!! :-D LOL! Talk about raining cats & dogs!!!! LOL! OMG, Balcony! It was, indeed, lucky that no-one got hit, and no wonder you have such clear memories of those plants. Yes, you can grow them very large in quite small pots. I quite like to see the little flowers, but I do pinch them out to get better foliage. I have grown them for many years. They are so easy to grow yet so rewarding! I have a couple of plants growing from seed on my kitchen windowsill in the pots of Amaryllis. One is now quite big. I don't know where the seeds have come from but they must have fallen in the compost from the year before when I let some plants flower on the kitchen windowsill. I didn't think they set seed without insect intervention. They obviously do, though! I like to see the lovely blue spikes of flowers, too!